Die Mannschaft is simply unstoppable, yesterday they beat Argentina in a thrilling Match with Extra Time and Penalties. I'm sure there are hundreds of dead old People, whose weak Hearts just couldn't handle the Tension anymore, laying in their Houses all over Germany, and with the current Weather this might turn into some nasty, smelly Surprise :) ! AmsterS@m and part of his Posse went to the Country of the Champion to celebrate the new Happiness that has taken over Germany, and it's the Party of the Century...makes you wonder how they're going to crank this up even further when they actually win the Cup :) ! Thursday Evening the dutch Government has resigned, so it's safe to say it's gonna be a good Day today :) ! Their infamous Leader, PM Harry Po..ehm, sorry, JP Balkenende and his Minions tripped and fell over the Hirsi Ali Affair that Evil Rita tried to use for her own dark Purposes and now got kicked in her fat Azz by it...oh the Humanity! Here's a follow up on 2 Topics discussed on this Site earlier...a good Explanation Why beautiful Women are Crazy and a nice Initiative from some Netizen to Stop that Red-Card-loving russian Referee that made sure the Holland:Portugal Match will go down in History as a unique Display of Male Insanity! Good for them that we Men are Stoooooopid! 4 Players from both Teams got a red Card and had to leave the Field, there were almost 20(!!!) yellow Cards, this has never happened before in a World Cup Game...they must've been stoned and drunk!?!?! Well, at least the Germans will enjoy the Cup even more now, this will be a good Source of Jokes for Decades to come :) ! Be careful on the 'Autobahn' in the next couple of Days, there'll be a lot of pissed off People in orange Caravans going West, Mhuahahahaaaaa! Zee Djermans did it again, they're playing the best Football in many, many Years and seem unbeatable, Bye Bye Swedish Team! AmsterS@m and his Entourage are going to the Country of the future Champion next Weekend to witness the Madness and excessive Partying from up close and personal! With Supporters like this one, it's no Surprise they're playing like Gods :) ! Good Luck Germany :) ! Later today the dutch Team will play Portugal, all our positive Energy goes out to the Oranjes, heel veel Succes and God Speed! 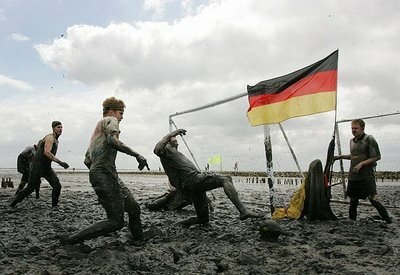 Germany, we'll see you in the Finals :) ! Uuuuuli we're coming, keep the Beer cold! And while the Germans are having the biggest, most peaceful Party ever and play the best Football possible without actually being Brazilian, the Dutch are playing with little, ugly, furry Animals...c'est bizarr, non?!?! Well, not ALL dutch People like Wuppie :) ! At least we've had a nice, sunny Weekend, and of course all that Water is very good for the Plants :) ! AmsterS@m is back in the Netherlands, after a lovely Vacation in the 'Land of Happiness', formerly known as the 'Land that invented Uptightness', a.k.a. Germany and brought back some more Impressions from the World Cup...enjoy :) ! Got all excited and sweaty by this Display of Patriotism, Fan-Fun and painted Skin? Here's something to cool you down a bit ;) ! But luckily not all dutch Fans can Pee wile standing up (NSFW)! You like? Here's a Summary of the best Efforts to support the Teams. This open-hearted Show of international Fun&Friendship only leaves one Question unanswered, Who ate all the Bratwurst?! If you happen to be one of the 3 People who don't like watching the Cup, why don't you go and let Evolution help you find a Date?! Dear MonkeyDogGirl, you better not be serious...and if you are, I'll find you :) ! Oh what a Summer, the World Cup starts very peacefully, Everybody is having a great Time and partying like there's no tomorrow, celebrating the new, relaxed Germany. AmsterS@m has temporarily relocated his Headquarters to this lovely Country to witness the first Matches and enjoy Tons of Beer&Bratwurst :) ! Of course it helps that it's burning HOT every day since the Cup started, all the Hooligans are cooling down in Swimmingpools and Beerpuddles! Naturally the Dutch are still the Champions in loving Fan'ism :) ! Yesterday was the Day of the Beast, yet the World as we know it didn't end! That's good News I'd say :) ! More good Things are supposed to happen soon, the World Cup starts Friday! Dear MonkeyGirl, don't worry, the S@mster will free your Mind :) !! This Month is of course devoted to the World Cup! Others get confused...but he's not the only one! And while some are already singing Schade Deutschland alles ist vorbei, they should be aware that zee Germans have Internet too :) ! Lets hope it doesn't rain too much! Though not everybody likes Football, some even take drastic Steps to avoid it, like leaving the Country or taking their Clothes off! And if you also don't believe in the 'Orange Craziness', and don't want to wear a Nazi-Helmet for Fun, then go and get Hasselhoffed!